Tackling war legacies has required both time and efforts that neither Hanoi nor Washington have been reluctant to do over the past decades, making the relationship a case study of foe-turned-friend. On March 26, 2019, a landmark event held in Washington D.C titled “Overcoming War Legacies: The Road to Reconciliation and Future Cooperation between the United States and Vietnam” explored cooperative efforts and lessons learned from the building of a strong US-Vietnam partnership. The event brought together two sides’ leaders and experts, including Vietnamese Deputy Minister of Defense Nguyen Chi Vinh, Vietnamese Ambassador to the US Ha Kim Ngoc, Senator Patrick Leahy, Deputy Secretary of State John Sullivan, President of the US Institute of Peace Nancy Lindborg, and former US Secretary of Defense Chuck Hagel. Cooperation between the former adversaries to account for missing Americans and assist Vietnamese suffering from war-related disabilities initiated in the 1980s to heal the devastating consequences of the war, according to the US Institute of Peace. The joined efforts have expanded to locating and removing unexploded ordnance (UXO), remediation of dioxin/Agent Orange (AO) contamination at former US airbases, and assisting persons with disabilities regardless of cause. The decades-long joint humanitarian effort to overcome the legacies of war has enabled the two countries to achieve the normalization of post-war relations based on mutual respect. In recent years, the two countries have shared interests in encompassing diplomacy, trade, and regional security. From these foundations, Vietnam and the US have built a comprehensive partnership that covers every aspect of the relationship, from politics, defense and health to trade and people-to-people ties, according to the US embassy in Hanoi. Since 1988, Washington and Hanoi have conducted 134 Joint Field Activities in Vietnam to provide the fullest possible accounting for US missing personnel from the war. The three decades of sustained operations combined humanitarian effort through the Defense Prisoner of War/Missing in Action Accounting Agency (DPAA) and its predecessors in coordination with the Vietnam Office for Seeking Missing Persons (VNOSMP). As a result, it has led to the accounting of 727 Americans in Vietnam. There are 1,246 Americans still unaccounted-for in Vietnam from the war; 1,591 American personnel remain missing from the Vietnam War. Since 1993, the US has contributed over US$105 million to Vietnam’s efforts to clear away unexploded ordnance, develop training and provide resources for Vietnamese disposal teams, deliver assistance to victims and their families, as well as provide landmine and UXO risk education in high-risk areas, according to the US Agency for International Development (USAID). 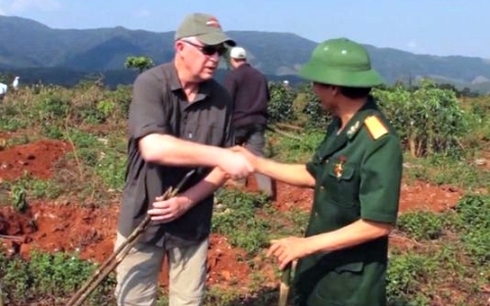 This year, the US is on track to contribute at least US$12.5 million and looks forward to continued and close cooperation with Vietnam, as well as provincial and international partners, helping rid the country of the scourge of UXO. Quang Tri province, a bloody battle field where most of the work is currently focused, is on track to be declared “impact-free” by 2025 and will be the first province in Vietnam to reach that goal. The US government agreed to complete dioxin remediation, or cleanup, of the Danang airport and Bien Hoa airbase due to high dioxin concentrations in soil and sediment remaining from the Vietnam War. After completing environmental assessments of these sites that estimated the extent of dioxin contamination, the USAID and the Vietnamese Ministry of National Defense launched joint efforts to clean up the dioxin contamination and reduce the risk of dioxin exposure to the surrounding community, while developing Vietnamese capacity for environmental assessment and remediation. Danang airport success: Starting in 2012 with an investment of US$110 million, the Danang Airport Remediation Project used both thermal treatment and containment remediation approaches. The thermal treatment strategy involved three major steps: building an enclosed, above ground treatment structure; excavating and placing dioxin-contaminated soil and sediment into the structure; and heating the contaminated soil and sediment to a high temperature (approximately 335ºC) to destroy the dioxin. In June 2017, the USAID and the ministry confirmed successful thermal treatment of dioxin contaminated material. After site demobilization was complete, on November 7, 2018, US Ambassador to Vietnam Daniel Kritenbrink and the ministry’s Vice Minister Nguyen Chi Vinh announced the successful completion of the project. Bien Hoa airbase: In 2016, the USAID completed an assessment of dioxin contamination at Bien Hoa airbase, the primary Agent Orange storage and handling site during the Vietnam War. The assessment also developed and evaluated potential remediation alternatives, including both containment and treatment options, to reduce the risk of dioxin exposure on and around the airbase. The assessment identified almost 500,000 cubic meters of dioxin contaminated soil and sediment in need of remediation – almost four times the volume in Danang. The Dioxin Remediation at Bien Hoa Airbase Area Project will be conducted in five years with a cost of US$183 million to remediate high-risk areas using treatment and isolation methods similar to those used at Danang Airport. The USAID estimates overall remediation efforts will be completed over a ten-year period. Assisting persons with disabilities (PWDs) has long been one of the top priorities for the US government in Vietnam. In Vietnam, US assistance has helped to improve the quality of life of PWDs, by addressing medical and social needs, improving disability policies, and reducing physical and social barriers. The US government has contributed more than US$100 million in assistance to PWDs in Vietnam. Over the course of 30 years, the USAID assistance has benefited hundreds of thousands of PWDs in Vietnam. More than 30,000 of these PWDs received direct assistance, including assistive devices, rehabilitation services, education and vocational training, home improvements, independent living assistance, legal counselling, and/or job placement assistance. The USAID also supports local governments to implement the national disability law and the International Convention on the Rights of Persons with Disabilities. Apart from influencing public policies, the USAID supports the development of legal framework to improve physical accessibility for persons with disabilities in public buildings and transportation, as well as increase access to information and technologies. PWD supporting programs is viewed by many as contributing to successful US-Vietnam cooperation to overcome the painful past shared by the two countries. The USAID continues its support to PWDs in Vietnam through eight projects which aim to expand rehabilitation services for PWDs, increase social support, improve disability policies, and reduce environmental barriers. Next ›How can digitalisation ease the plight of Southeast Asia’s smallholder farmers?